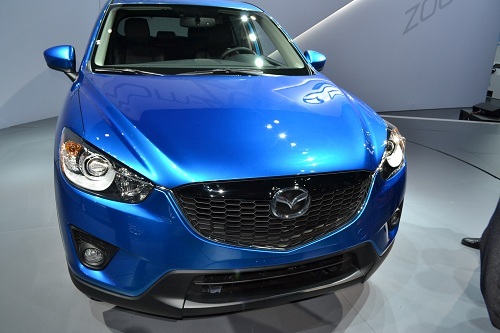 The new redesigned 2013 Mazda CX-5 made its debut at the LA Auto show. The Mazda CX-5 will provide class leading fuel economy, captivating design, functionality, safety, and great handling. All aspects Mazda vehicles have become to be known for. "The 2013 CX-5 is the vehicle compact SUV shoppers have been asking for - that only Mazda can build," said Jim O'Sullivan, president and CEO, of Mazda North America. "Entering an extremely competitive segment, the all-new CX-5 has to offer more than just flash and features, but also has to perform and provide consumers with the dynamic response they've come to expect from Mazda - and it does. With its SKYACTIV underpinnings and best-in-class fuel economy, CX-5 proves that fun needn't be sacrificed for fuel efficiency and that compact doesn't equate compromise." Under the of hood of the Mazda CX-5 lies the SKYACTIV-G 2.0-liter gasoline engine. At 13:1, SKYACTIV-G features the world's highest compression ratio for a mass-produced car. With its all-new 4-2-1 exhaust system, the 2013 CX-5 delivers 155 horsepower at 6,000 rpm, torque is measured at 150 lb-ft at 4,000 rpm and redline is reached at 6500 rpm. Choices in transmission setup range from the SKYACTIV-MT six-speed manual or SKYACTIV-Drive six-speed automatic, a 2,000-pound towing capacity and an optional all-wheel drive, the 2013 CX-5 truly offers a little of everything for everyone. With SKYACTIV Mazda is able to deliver best-in-class fuel economy. Estimated EPA ratings for the CX-5 is 26 city/33 highway for a front-wheel drive equipped with SKYACTIV-MT. When equipped with SKYACTIV-Drive, the front-wheel drive model garners 26 city/32 highway. The all-wheel drive version, only available with SKYACTIV-Drive, also is a fuel sipper with an EPA rating of 25 city/30 highway. Outfitting the CX-5 is a new "signature wing" front grille that dominates the front of SUV. Its black elongated trapezoidal pattern adds masculine depth, while wing-shaped, wraparound headlamps extend out. KODO, or "Soul of Motion," is the styling and design language inspired by nature that Mazda will use on the CX-5. In a single motion is supposed to evoke how both startling beauty and immense power can be captured. The KODO design philosophy was first shown on the 2010 on the SHINARI concept car, a long and lean four-door sports coupe, and then on the MINAGI concept SUV earlier this year, from which CX-5 is based. KODO represents the future direction of Mazda's styling for it's vehicles. The CX-5's has sculptured body features taut, compact lines. Shapely front and rear fenders are fitted on the sporty SUV's, which come available with 17 or 19-inch rims. This projects a wide, and low-slung stance. A sweeping swoosh line bridges the four corners with sleek, artistic expression. Topside, a pronounced crease begins at the A-pillar and darts sharply across the side panels, eventually wrapping itself around stylized tail lamps. The sharply raked A-pillar is matched by the angles of the C-pillar and rear window, topping an aggressive profile which, at the same time, affords all occupants one of the widest fields of view in the segment. The rounded surfaces on the CX-5 are not just for looks though as they also serve a function. With a targeted drag coefficient of 0.33, the CX-5 aims to be the most aerodynamic compact SUV in the field. The CX-5's interior will be just as design oriented at the exterior. Frequently-used controls are within reach and intuitive to use. Also the CX-5 sits on a segment-leading 106.3-inch wheelbase, seats five and offers a cabin that is flexible for accommodating a large variety of people and lifestyles. Rear cargo room is spacious with a three-piece independent 40/20/40-split fold-flat second row, the CX-5 shows that whatever is thrown its way, it will catch - with room left to spare. A single-action topside button releases the left- and right-side seats to fold down while a looped handle frees the middle seat, which also folds flat, a small SUV segment first. Up front, both the driver and passenger can enjoy 40.1 inches of headroom (when not equipped with a moonroof), 57.5 inches for the broadest of shoulders and 41.0 inches to stretch their legs. Six- and eight-way power-adjustable seats will be standard on all trims of the CX-5 (excluding entry-level models). Legroom for the second row is ample at 39.3 inches with an equally generous knee clearance of 2.6 inches. The wide cavity under the front seats also offers quite spacious rear passenger foot space and can be used as additional cargo room to hide personal belongings. Rear headroom is 39.0 inches for vehicles not equipped with a moonroof. The CX-5 will feature an all-new 5.8-inch touch screen. This is the center of attention with intuitive phone, audio and navigation functions. Streamlined steering wheel controls also enable a more straightforward operation of the infotainment system. Mazda's advanced keyless entry system and push-button start get the CX-5 going. Other available features on the all-new 2013 CX-5 include Bluetooth phone & audio connectivity with iPod audio playback. A nine-speaker Bose Centerpoint Surround Sound system with AudioPilot was jointly developed with Mazda to please even the most discerning music enthusiasts. Mazda and TomTom will feature premium North American maps, advanced lane guidance, intuitive voice recognition and real-time traffic. The CX-5's SKYACTIV-Body and SKYACTIV-Chassis ensure a vehicle structure as reinforced and quiet as it is rigid and absorbs impacts. Re-examining the suspension and steering systems, the lightweight construction of the chassis includes a front strut suspension and a multi-link rear formats. This gives the Mazda CX-5 that familiar Mazda handling. The body is comprised of 61 percent high-tensile steel, creating a lighter, stronger body with superior handling. Also the CX-5 uses 1,800MPa ultra-high tensile steel in manufacturing. As a result, the overall structure is 8 percent lighter than previous Mazda models. Located in the front and rear bumper beams, they are 20 percent stronger and 10.6 pounds lighter than predecessors. Standard safety offerings include six airbags (front, side and full side-curtain), four wheel disk brakes, anti-lock brakes (ABS), daytime running lights, active headrests, Dynamic Stability Control (DSC), a Traction Control System (TCS) and a tire pressure monitoring system (TPMS). Also available are a Blind Spot Monitoring (BSM) system, Adaptive Front-Lighting System (AFLS) with auto-levelling bi-xenon headlamps and a rear view camera with distance guide lines.